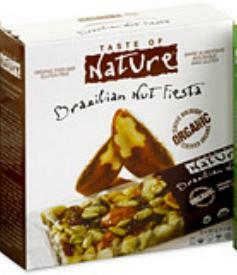 Taste of Nature is a company that sells all different kinds of delicious bars. They are a Canadian based company but they sell their bars online to the US. All of the ingredients are from nature and contain no artificial ingredients. The bars are organic and delicious! For my review, I was sent a bunch of samples of these bars. My favorite that I have tried so far is the Argentina Peanut Plains bar. It is composed of peanuts and agave syrup and tastes like a candy bar! Each of these bars have 230 calories, 8 grams of protein, 2 grams of fiber, and 6 grams of sugar! Not too shabby! Here is some information that I found interesting on why agave syrup is better for you than regular sugar: "Agave Syrup is composed of 80 % Fructose, 15 % Glucose and 5 % Sucrose. However, the GI level of agave standard is 32. Honey is at 58, cane table sugar at 64. Based on the amount used for same sweetness, Agave syrup caloric count is 11 % less than cane sugar, 40% less than honey." Very cool! Check out these products online on the Taste of Nature website.